Start from the beginning, what is business architecture? If this definition is new to you, it’s because it was just ratified in January 2017 by a lot of enterprise architecture organizations (including the Business Architecture Guild®). P.S. That’s a big deal. I don’t mean to make it sound less romantic, but business architecture is documentation of your organization at a high level. We like to call it a “blueprint” (just like you have for your house, except made up of different stuff). So business architecture is a thing? Yep, but how we use it is where it gets really, really interesting. The “why” of business architecture is a separate topic. We’ll StraightTalk on that in Post No. 2. You document your organization’s business architecture in a knowledgebase (ideally in an automated tool). Now that you have lots of info in there, you create any type of blueprint (diagram) or report you want. Business architecture helps any type of organization, including corporations, non-profits and government. Of any size, from very large organizations to a sole entrepreneur. In any industry. Got it. What makes up business architecture then? 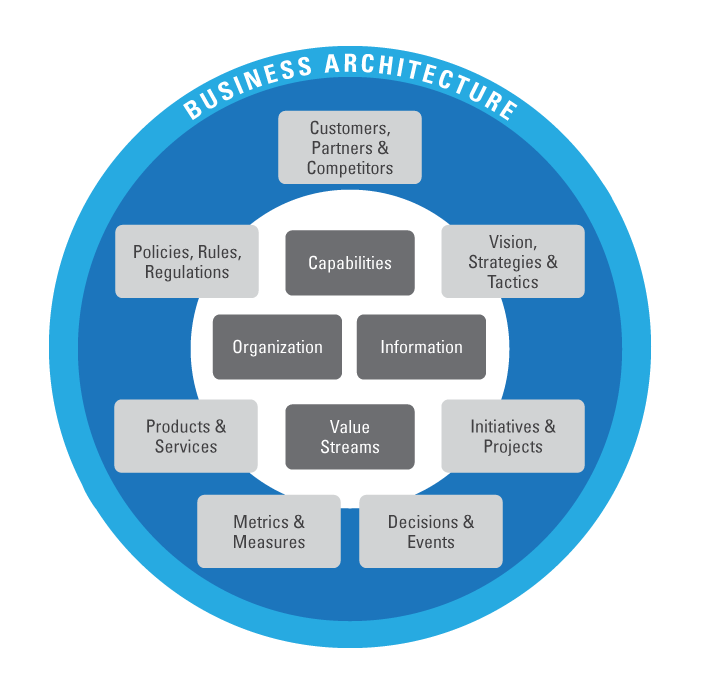 Below are the perspectives that are included within the scope of business architecture. Each box is officially called a “domain.” If it’s not in this picture, then it’s not business architecture. Not business architecture. But we can connect business processes to the business architecture. LOTS of collaborative work has been done by the business architecture and business process communities to come to this conclusion. More in future posts. Nope, not business architecture either. Same story as above: communities came together and determined that we connect. Applications are part of the application architecture. But we connect them to the business architecture! Well, what about strategy and business models then? Business architecture (and brilliant business architects) inform and translate strategies and business model changes into the set of coordinated actions needed to make them real. Business architects may also help to document these things (because we’re good at stuff like that). If you are a business architect and you formulate strategy and business models, that might be more related to your personal skills and experience versus the intention of the role, which is one of translation. Okay, how about customer experience design? Not business architecture, but a complementary discipline. Business architecture translates customer experience designs into action, too. Don’t hate me. Lots of great minds have been working to untangle this thing for years now. Business architecture works with lots of teams across the strategy execution lifecycle (i.e. we have a lot of friends). While some debate and differing opinions currently exist related to what is right and wrong, there is what works—and the delineations described above are very clean and have stood the test of time in practice. Where does business architecture fit in the scheme of things? Business architecture has a very special role right between strategy and execution. It’s not a project thing—it happens upstream from projects and defines their priorities and scopes. More StraightTalk on this later and how business architecture “bridges strategy and execution” as we say. We look at enterprise architecture as a collection of disciplines and business architecture is one of them.Enterprise Architecture = Business Architecture + Application Architecture + Data Architecture + Technical Architecture. One happy family. What is Business Architecture? (S2E Premium White Paper): A longer and more formal version of this story on what business architecture is and is not, and where it fits in the scheme of things. Business Architecture: Setting the Record Straight (Chapter Reprint from S2E and TSG – revised January 2019): An even more formal overview of what business architecture is. Business Architecture: Dispelling Twelve Common Myths (S2E and TSG White Paper – revised January 2019): A short little one with some common misconceptions about business architecture. Introduction to Business Architecture (Part 1 of the BIZBOK® Guide from the Business Architecture Guild®): The official word on business architecture. Word. Top 10 Unexplained Mysteries of The World – Explained Just for fun. Because it has absolutely nothing to do with business architecture.